Bending Process - BLIKSEN CO., LTD. 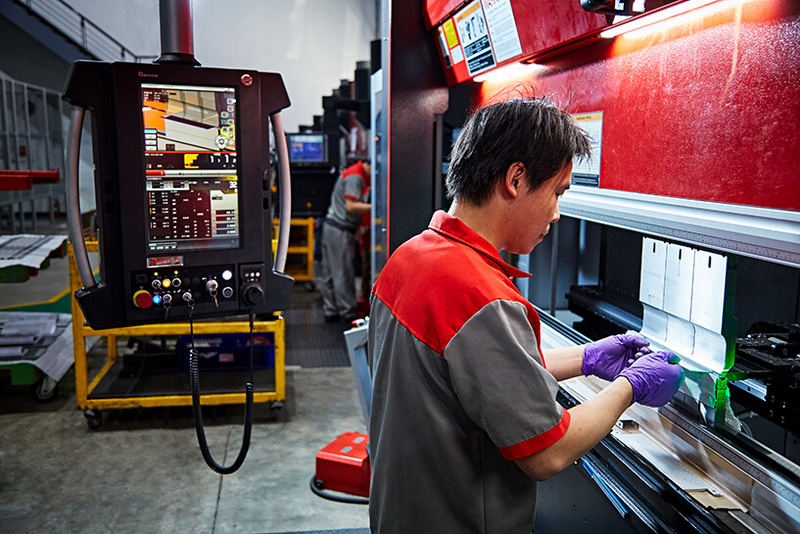 The second step in sheet metal processing involves forming by bending and uses an upper and lower mold to press the workpieces. 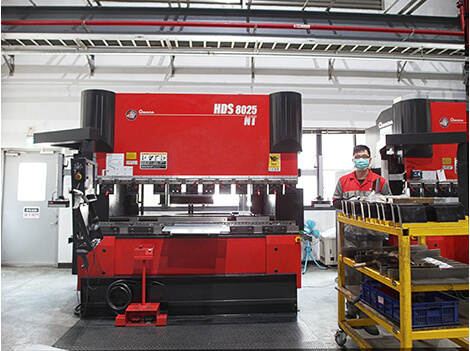 The bending process will be separated into manual processing and mechanical arm processing. 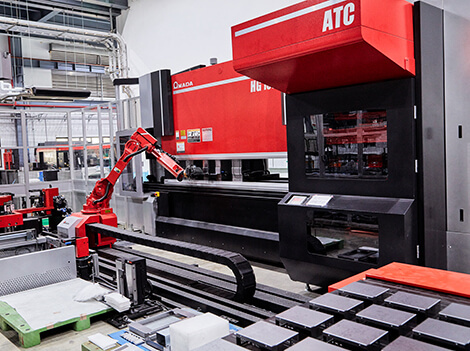 For large quantities and high volume repeat orders for specific items, the workpiece will be manufactured through use of a mechanical arm in order to achieve consistent product quality. 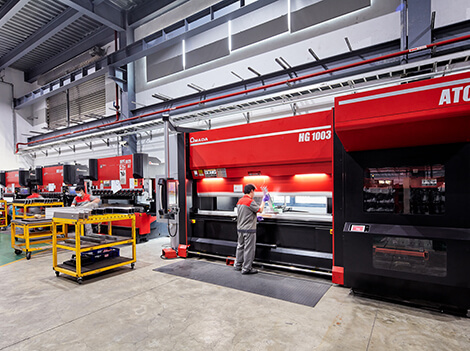 Small-volume production of a wide range of different items, workpieces or customized workpieces requiring specialist skills and experience are processed by the operator. 24 hours operation, automated operation, improving production capacity. In order to ensure the safety of our workers, all the machines are equipped with safety sensors. If a body part were to enter the processing range, the machine will stop working immediately. Before bending, the bending simulation software will be used to determine the level of the bending to assess whether there will be any bending interference. Processing will begin after adjusting this information. 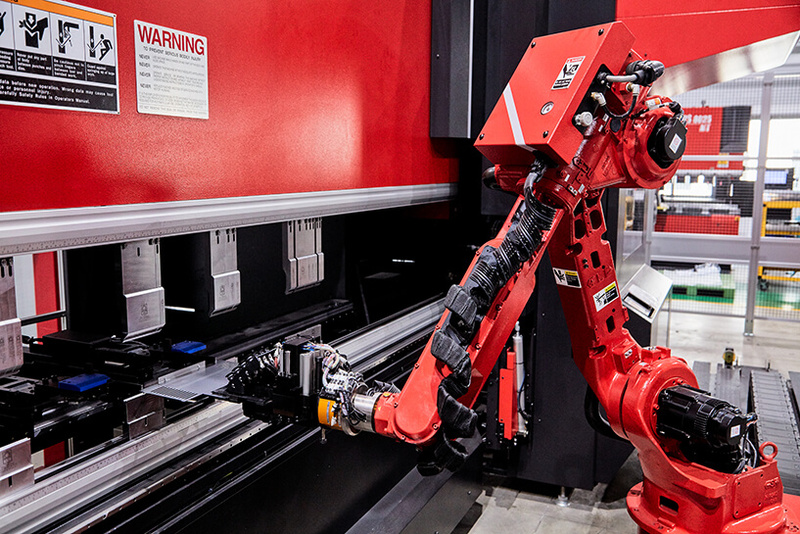 Robotic arm and conveyor belt operation：24 hrs and unmanned operation improves production capacity. Automatic mold change / multiple fixtures：Shorten the diversified product processing time. Angle sensing device / X axis positioning gauge：auxiliary confirmation of the Robotic arm’s bending angle and the workpiece positioning to fulfill zero error processing. Automatic mold change：Shorten the diversified product processing time. Angle sensor：Assist operators to confirm the angle and thickness of plates to fulfill high precision processing.